close ups of the quality of her work. to enlarge them for a closer view. These very collectible and durable quilts are made valuable by their unique provenance and quality construction. The fact that these quilts are made by the hand of an actual daughter of a Confederate Soldier and not a factory reproduction makes them highly collectible. To verify this assertion, simply look around and try to find another quilt like this made by a “Real Daughter”. This lady learned the craft of quilt making from her mother (the wife of a Confederate Soldier) and she makes her quilts the way she was taught. They are mostly hand sewn with some help from a machine around the seams. The King size quilts measure 105 inches wide by 106.5 inches long. 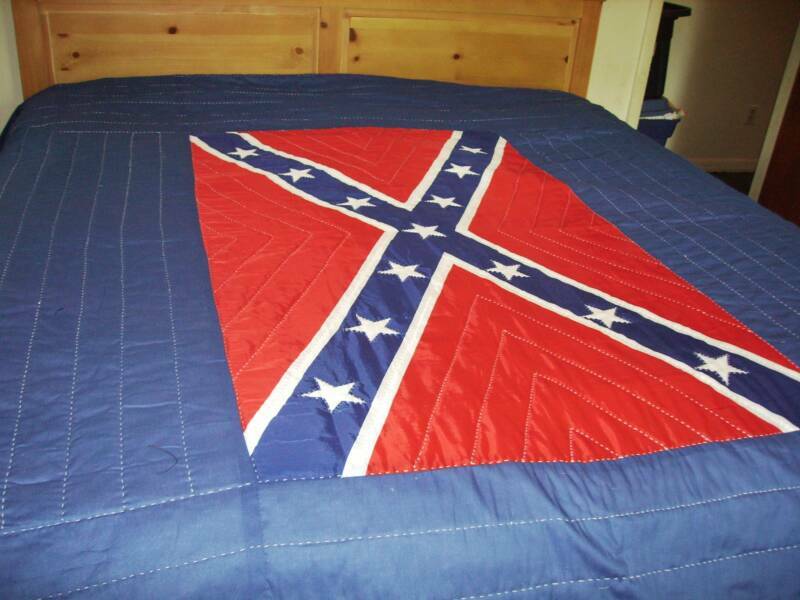 The flag itself is taken from a regular nylon flag and is stitched into the quilt. The distance between the stitches runs 2/16th of an inch to 3/16th of inch along the stars, border and stripes of the flag. The same seam distance is observed all over the other parts of the quilt as well except for the machine-sewn seams. Those seams are tucked under and stitch distance is not noticeable. Approximately 90% of the flag is hand-sewn. The top quilt material around the flag is mostly navy blue and made of a cotton-polyester blend fabric with some sheen to it. The padding or ticking is a polyester material. The backing material is thicker, and is usually flannel or mostly cotton fabric with some blended fiber for durability. The corner of the quilt bears a label with her name on it. Mrs. Katie is obviously elderly and wishes to have her privacy protected. She has made these quilts available for sale in conjunction with a local SCV effort to raise funds for a Confederate Soldier’s Monument in Metter, Georgia. A portion of the proceeds from this sale will go towards that effort. Buyers of her quilts will also get a framed and notarized certificate of authenticity with Mrs. Katie’s signature, a photo of her and brief biography of her father’s service. Quilts will be mailed via U.S. Postal Service Priority mail with insurance. There are only a handful of quilts like these made by Mrs. Katie. Until recently all of her quilts were done for family members only and were all patchwork. 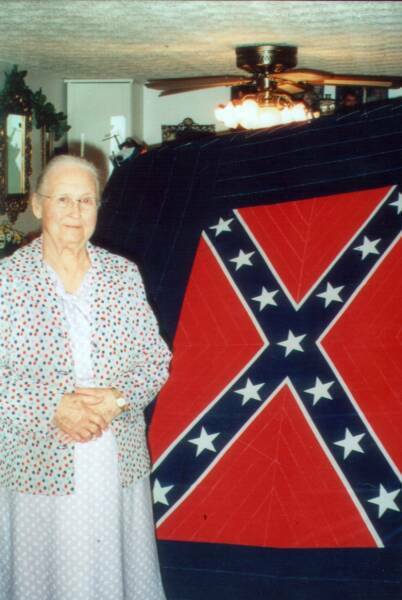 These confederate flag quilts were specially commissioned as a special request. Unlike similar quilts that are cheaply made in China, these are the real deal: a Confederate themed quilt featuring the CSA battle-flag/naval jack made by an actual daughter of a Georgia Confederate soldier by her own hands. For those wondering how many real Confederate daughters are still living, there are not many. And even fewer of them are making hand-sewn quilts! Mrs. Katie is something of a statistical anomaly in that her father joined the Confederacy about the age of 10 as a “powder monkey”, which young boys sometimes did. He also served in a company of soldiers who worked at the Augusta Powder Works, which made gunpowder for the Confederacy. His young age at the time of service is responsible for Mrs. Katie’s presence now as a living reminder of her Confederate father. These quilts will be treasured heirlooms in years to come.